The enclose Light, IR Transmitter is device to be used as an identification and marking aid for vehicle and personnel ID, convoy operation, mine/obstacles, lanes for helipads, passage point, etc. It can be attached to military vehicle or can be carried by individual soldiers as an identification device when operation at night. The Light, IR Transmitter emits a signal which is not visible with the unaided eye but can be seen when view through Night Vision Devices. 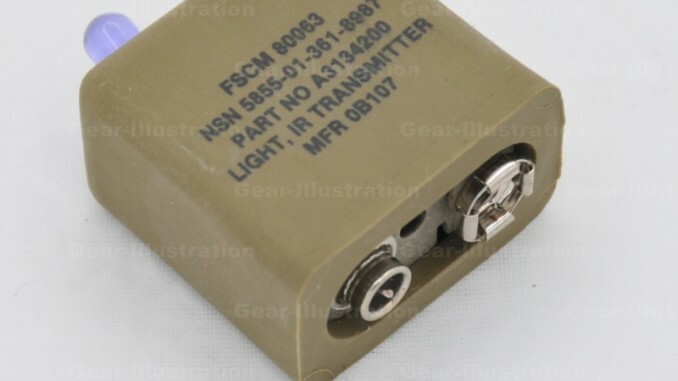 To operation this device, attach a standard 9V alkaline battery (BA-3090/U, NSN 6135-01-063-1978 or commercial equivalent) to the battery snap of the Light, IR Transmitter. The device will then emit pluse of light at a constant rate. This light is not visible without the aid of Night Vision Device. Removing the battery will cease its operation. Change battery nightly as prolonged use of the same battery results in reduced detection range. This light can be attached to a variety of military vehicle using whater means are locally available (tapes, ropes, etc.). Maximum detection range is obtained in the direction which the light is pointed. Instructions regarding the specific number of transmitters and location of attachment to a particular vehicle will be determined by the local commander. NOTE: WHEN CONNECTED TO THE BATTERY, THIS LIGHT IS VISIBLE BY ANY ENEMY WITH NIGHT VISION DEVICE.